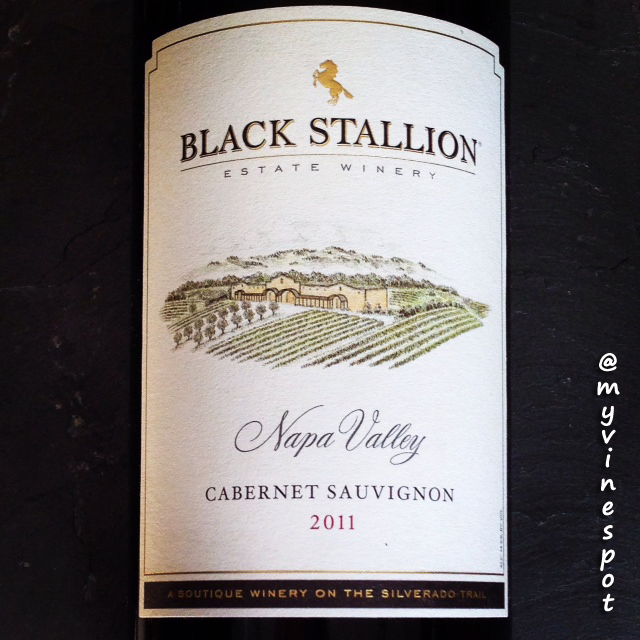 Today’s Quick Sip is the Black Stallion Estate Winery's 2011 Cabernet Sauvignon. Black Stallion Estate Winery is located in the Oak Knoll District of Napa Valley and situated on the grounds of a historic equestrian center. Remnants of the original 36 horse stalls are still visible today, although you are likely to find more wine production equipment than horse-related items. The winery prides itself on crafting high quality wines that are elegant, distinctive, and approachable. Their 2011 Cabernet Sauvignon endured a challenging vintage and delivers very good quality for a reasonable price. For further information and where you can find this enjoyable wine, please see my tasting notes below. Review: Black Stallion Estate Winery 2011 Cabernet Sauvignon (SRP $28): This Cabernet Sauvignon is blended with 5% Merlot and 5% Petite Sirah. In the glass, the wine displays a medium-deep garnet color with inviting aromas of blackberry, currant, and plum interlaced with brown spice and hints of mocha spice. The aromas come through on the palate with the addition of appealing black cherry fruit flavors. In the mouth, it is full-bodied and well-balanced, with a velvet-like texture, supple tannins, and a spice accented, full finish. Overall, this wine is accessible (easy-to-drink), budget friendly (under $20), and a wonderful choice to enliven any occasion or add to the dinner table. Region: Napa Valley, California. (Other info: ABV 14.5%, matured 18 months 25% French oak, 25% new French oak, natural cork enclosure.) 89 Points. Click here to find this wine. It has a suggested retail price of $28 and is available for as low as $19.99 on CorkExclusive with FREE SHIPPING on any size order. Get the Black Stallion Estate Winery 2011 Cabernet Sauvignon for just $19.99 plus FREE SHIPPING on any order!"